Stop into Dollar General and pick up everything you need to create a simple Meat and Cheese Platter, along with beer and wine for your next get together. Stop by your local Dollar General and check out their selection of beer and wine, perfect for making last minute entertaining easy! During November and December, there are so many great occasions to get together with friends and family. 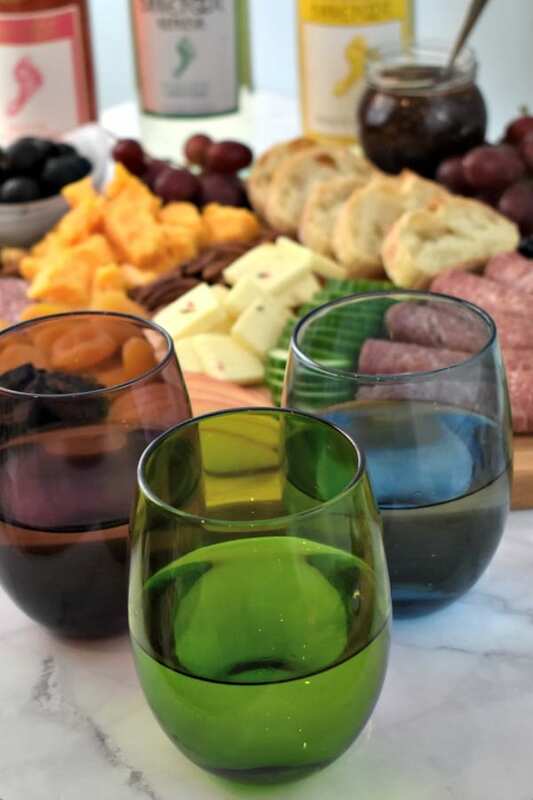 With so much going on, holiday entertaining can be stressful, but it doesn’t have to be. I’m going to show you how to put together a quick and easy meat and cheese platter for holiday entertaining. In fact, it is my favorite thing to serve because it’s as perfect for a girl’s night as it is for game day. In my opinion, the best get togethers are the ones where I get to enjoy my company, instead of spending all my time in the kitchen. When I’m in a time crunch, I look for simple shortcuts to make my life easier. Dollar General is a convenient place to grab beer and wine along with a few essentials you might also need for last minute entertaining like paper plates and napkins. You’ll be amazed at what you can find at Dollar General to help you organize a low key but special get together. Along with dry goods such as nuts, crackers, napkins and paper plates, you’ll find fresh foods like cheese, apples, berries and cucumbers which you can use to build your meat and cheese platter. 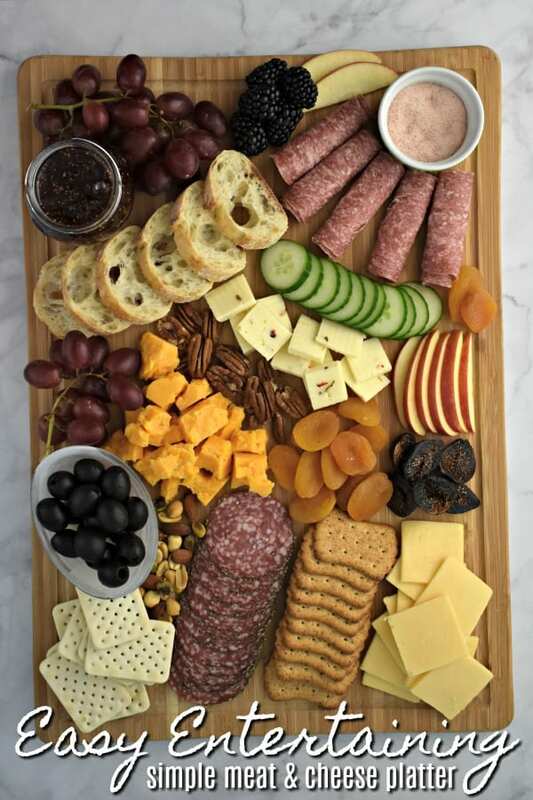 Serving a meat and cheese platter is probably the easiest party food you can put together. There’s no cooking or baking and very minimal prep. When you provide a nice variety of nibbles, all your guests will find something they like. It’s perfect for people with special diets, too. 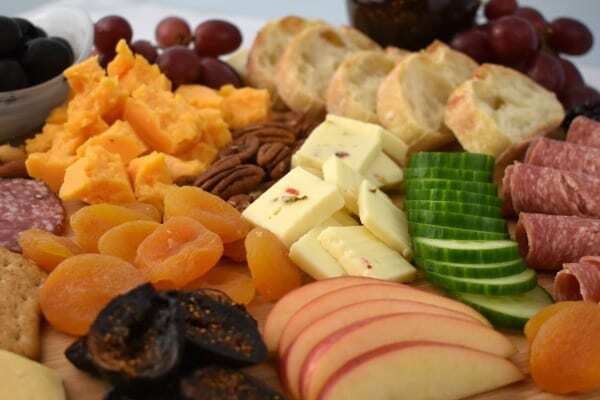 Round out your meat and cheese platter with some fresh and dried fruit and mixed nuts to balance all your flavors. A spreadable herb cheese spread or goat cheese and chutney or preserves are also delicious on a meat and cheese platter. I also included olive oil and pink Himalayan salt. Be sure to set out toothpicks, and a small spoon for your chutney or preserves. Pro-Tip: Plan on 2-3 ounces of meat per person and 1-2 ounces of cheese per person. For a party with six guests, plan on 12-15 ounces of meats, and 10 ounces of cheeses. Pro Tip: Serve your cheeses at room temperature for best flavor. If you choose to put out larger pieces of cheese for guests to cut themselves, provide a different knife for each kind of cheese you are serving. Start with the largest items first such as meat, cheese and bread. Add medium-sized items next such as ramekins. Fill in with smaller items like dried fruit and nuts. This is a simple and easy "recipe" for entertaining without a lot of prep! Start with the largest items first. I placed on the slices of bread and piles of cheeses on my board first. Next, I rolled the Genoa salami up and fanned it out around the ramekin of Himalayan salt. After adding on the jar of fig preserves and dish of olives, I added the crackers. Lastly, I added the grapes, dried apricots, apple slices, dried figs, blackberries and mixed nuts. Next to the board, add other accoutrements such as olive oil along with napkins, plates, cheese knifes, etc. How many bottles of wine do I need? Plan on 2-3 glasses of wine per person. For a small gathering of six friends, I estimated three to four 750ml bottles. For this occasion, I served Pink Zinfindel, Pinot Grico, and a Moscato Spritzer. Be sure to check out the low prices and great selection of beer and wine at Dollar General. 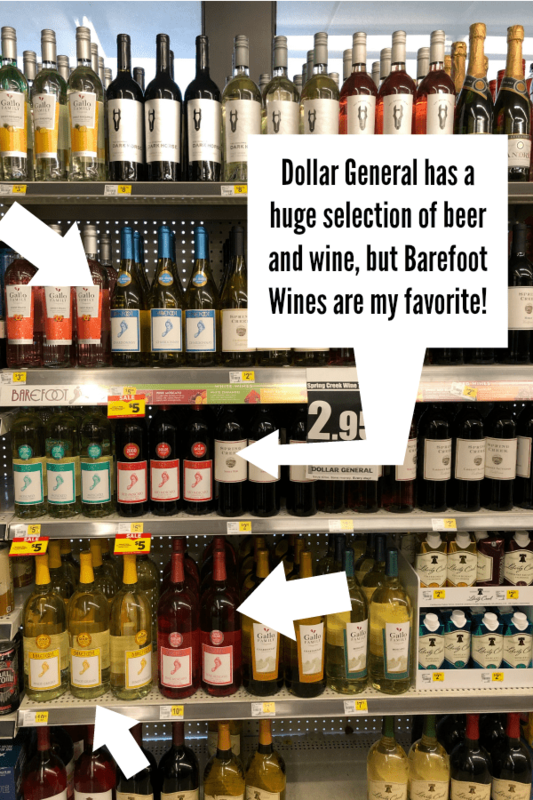 Selection may vary, but I found some of my favorite Barefoot Wines, along with a large selection of beer at Dollar General. It’s not a bad idea to grab and extra bottle or two just in case you have an unexpected guest drop-in, or your guests favor one wine over another. 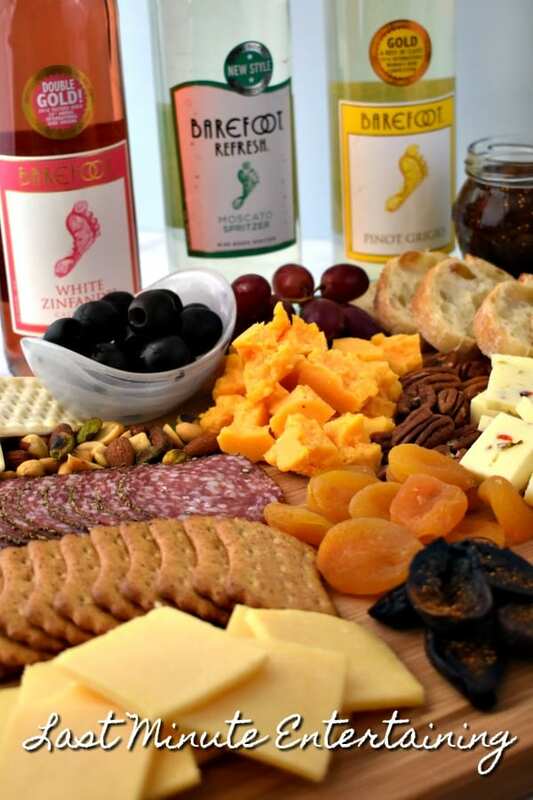 Besides, Barefoot Wines also make a great last-minute gift, too! 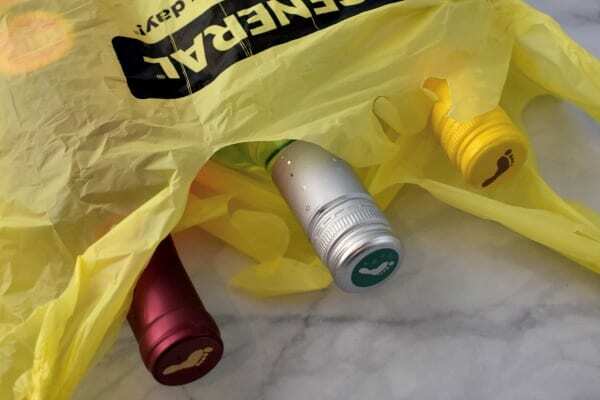 While you’re at the store, grab a couple wine bags just in case! Having a great play list will set the tone of your party. Do you want to be fun and funky or sophisticated? Serve foods that can be picked up in one hand so that guests don’t have to find a place to set down their drink in order to eat. To keep bottles of wine chilled, fill a large tub with salted ice water and set the bottles inside. Always have non-alcoholic options on hand for those that would prefer it. Prevent guests from crowding around a table of food by placing things in different areas. For more tips, check out this Secrets to Hosting a Stress-Free Holiday Party from HGTV. Here are some more great recipe ideas that your guests will love. The best part is that these can all be made up ahead of time, even the day before for most of them. If you have a few extra minutes, make our roasted garlic hummus and serve it with homemade pita chips. Our Red Velvet Cake Balls are a decadent make ahead two-bite treat that will wow your company! Grab some yogurt and whip up our dill Greek yogurt dip in no time. Serve with fresh veggies. Honey cinnamon almonds are a sweet and crunchy addition to any spread. Make a batch of Olive Tapandae Crostini or Caprese appetizers ahead of time. I was in Dollar General earlier this week and I was so impressed with the wine selection and the prices! Thanks for your tips and tricks to put together a great cheese board. It’s perfect for drop by guests and stress-free entertaining. Love it! Thanks for your kind note, Deb. I was surprised, too! This is my favorite way to entertain!! !